A Canadian security firm has added the former commander of Navy Region Mid-Atlantic to its board of directors. On Jan. 3, security and identity management company Route1 Inc. announced the appointment of Rear Adm. Mark S. Boensel, who retired Jan. 1 after more than 33 years of service. 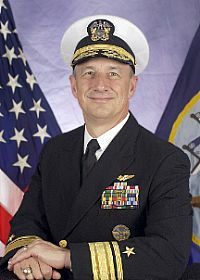 Boensel, who spent his last four years of active service at Mid-Atlantic Region, had an exceedingly diverse career that included years as a naval flight officer and flight instructor — he accumulated more than 3,200 flight hours and more than 600 carrier arrested landings — as a military assistant in the office of the Under Secretary of Defense for Policy, as director of the Chief of Naval Operations Environmental Readiness Division and as commander of Navy Region Southeast. Boensel also holds post-graduate degrees in Business Administration, International Relations, and National Security and Strategic Studies.